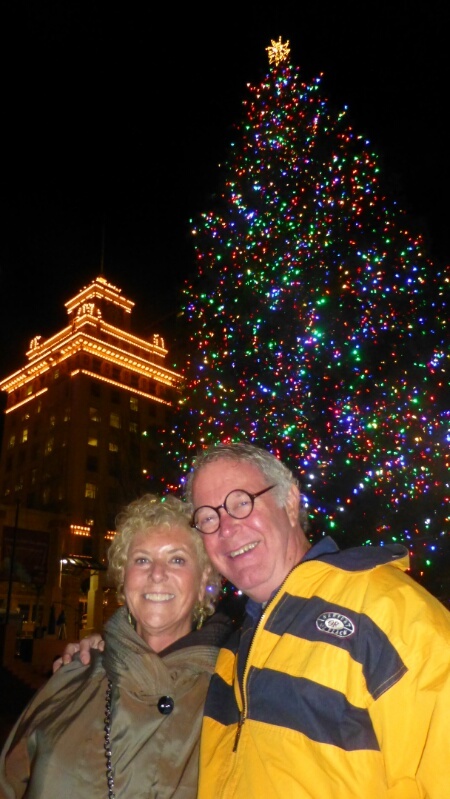 Kappy, Bernie and Kathy, Doyle, Michael, Beth and Jim, Sybil and James, Cole, Lillie, Weston, Hayden, Topaz, and Kerri — thanks for making our Portland Christmas everything we hoped it would be. But enough of the freezing fog already. It’s back to Puerto Vallarta (and sun, and beach, and surf) tomorrow. Hi Tom and Louise. Great Christmas picture of the two of you! What an adventure you are having. Enjoying your updates and looking forward to more in 2014! Happy New Year from Eugene. It’s so good to hear from you again, Trudy. That picture is of the Christmas tree in the Pioneer Courthouse Square in downtown Portland.